Home › Toys › Factory Entertainment Game Of Thrones House Lannister Lion Sigil Throw Plush .. Factory Entertainment Game Of Thrones House Lannister Lion Sigil Throw Plush ..
Make sure that you're content and comfortable while watching the Game ofThrones with this officially licensed pillow! This pillow features yourfavorite family's crest on one side and slogan on the other. 100% Polyester From the Manufacturer Game of Thrones House Sigil Throw Pillow Collection: Based on the popular HBOseries, Game of Thrones. Bring a touch of Westeros to your home with theseelegant throw pillows featuring the sigils and mottos of House Stark, HouseTargaryen and House Lannister. House sigils on one side and their Motto's onthe reverse. Where does your allegiance lie? 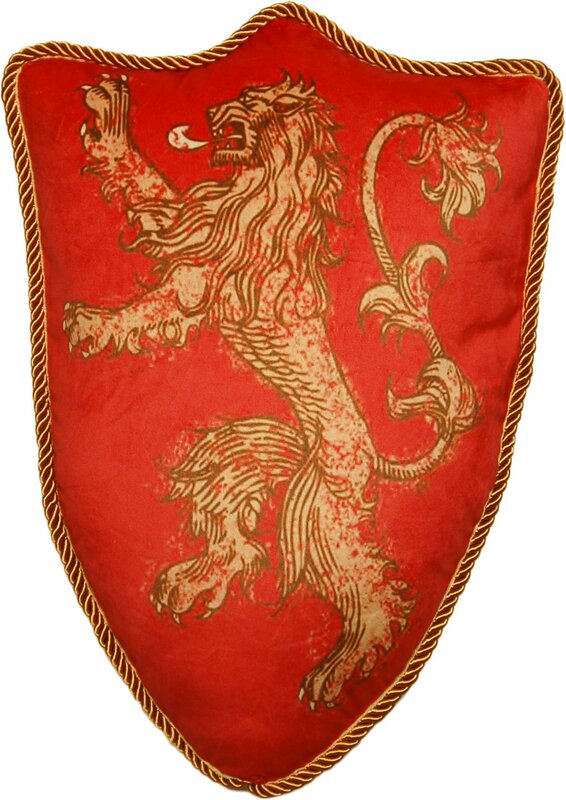 Each pillow is crafted in theshape of a heraldic shield from exquisite velveteen textured fabric. Thepillows have an ultra-soft filling and measure 22" long x 15" wide x 6" thick.Collect all your favorite Game of Thrones collector throw pillows, each soldseparately.